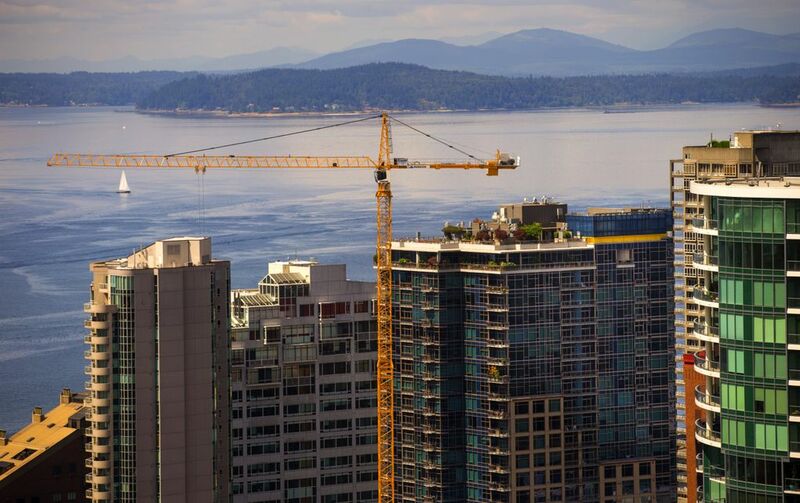 All those cranes on Seattle's skyline are a sign of more than buildings. Here are some back stories — and challenges. The mid-year report from the Downtown Seattle Association shows a remarkable picture: 106 projects under construction, about to break ground or completed since January 2014, the largest building surge since the organization began keeping track in 2005. 1. It’s not just Amazon.com anymore. Although the technology giant is huge in the Denny Triangle and South Lake Union, it’s not the only driver behind office construction. Weyerhaeuser is coming to Pioneer Square; Expedia, Facebook, Apple and other technology giants are clustering in or near the core. The severe blow from losing Washington Mutual in 2008 has been healed and more. More than 7.1 million square feet of office space is under construction — more than four-and-a-half Columbia Centers. 2. The “back to the city” movement has legs. All over the country, millennials and others want to live in vibrant central cities with walkable neighborhoods, real downtowns and good transit. In Chicago, giant Kraft Heinz is the latest company to abandon suburbia for downtown. A study found that 500 companies had moved to urban centers in the past five years. According to the Boston Globe, the firms found the city locations attracted talent, built company culture and enhanced creative collaborations. Downtowns are also greener than car-dependent office developments in suburbia. 3. The action is continuing, at least for now. Beyond the immediate projects, several major buildings are in the pipeline, such as Wright Runstad’s audacious 850-foot tower as part of the redevelopment of Rainier Square, an 880-foot skyscraper on Second Avenue from developer Greg Smith and doubling the size of the Washington State Convention Center. In other words, capital and development expertise continue to see opportunity in downtown Seattle. Why? See points 1. and 2. If the Federal Reserve begins a slow and deliberate raising of interest rates, we will see how much staying power this has. In other words, who are the alpha dogs and who are the lemmings. But the fundamentals look sound. 4. A hidden advantage continues. In addition to its other pluses, downtown Seattle office space and rentals tend to be less expensive than the same products found in San Francisco and LA (and New York City and Boston). This wouldn’t matter if we were, say, Mesa, Ariz. But because Seattle is an attractive technopolis with a dense downtown, it benefits from this cost differential against other high-quality competitors. 5. Mobility is the long-term key. Wow, wish we hadn’t given our subway system to Atlanta years ago. This leaves Seattle’s core at a serious disadvantage against most of the cities listed above in moving people (even LA has built an impressive system of subway, light rail and commuter trains). Buses alone won’t hack it. Light-rail construction needs to move faster and hook in Ballard and West Seattle. More and more reliable Sounder trains must be added. Added benefits: A better transit system will expand the circle of affordable housing and lower greenhouse gas emissions. You can read the Downtown Seattle Association report here, including an interactive map. Downtown is never done and nothing should be taken for granted. Seattle City Council candidates should be paying attention, for the central core consists of several neighborhoods and pays for the rest. Its continuing health is paramount.